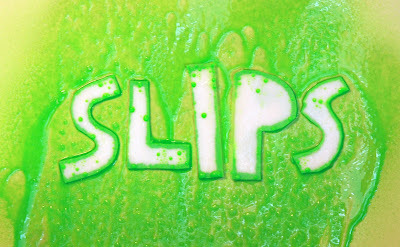 The word "SLIPS" is coated with the SLIPS technology to show its ability to repel liquids and solids and even prevent ice or frost from forming. The slippery discovery has now been shown to prevent more than 99 percent of harmful bacterial slime from forming on surfaces. A biofilm is an aggregate of microorganisms in which cells adhere to each other on a surface. An aggregate is a collective of different microorganisms that form a single system. Most people are familiar with slime, which is a kind of biofilm; Extracellular Polymeric Substance (EPS). Although slime is a biofilm, not all slime are biofilms. EPS is a polymeric conglomeration generally composed of extracellular DNA, proteins, and polysaccharides. Biofilms may form on any living or non-living surfaces and can be prevalent in natural, industrial and even hospital settings. Biofilms are formed for various reasons. Some include include cellular recognition of specific or non-specific attachment sites on a surface, nutritional cues, or in some cases, by exposure of planktonic cells to sub-inhibitory concentrations of antibiotics. When a cell switches to the biofilm mode of growth, it undergoes a phenotypic shift in behavior in which large suites of genes are differentially regulated. Biofilms may no longer have any solid ground upon which to stand. A team of Harvard scientists has developed a slick way to prevent the troublesome bacterial communities from ever forming on a surface. Biofilms stick to just about everything, from copper pipes to steel ship hulls to glass catheters. The slimy coatings are more than just a nuisance, resulting in decreased energy efficiency, contamination of water and food supplies, and—especially in medical settings—persistent infections. Even cavities in teeth are the unwelcome result of bacterial colonies. In a study published in the Proceedings of the National Academy of Sciences (PNAS), lead coauthors Joanna Aizenberg, Alexander Epstein, and Tak-Sing Wong coated solid surfaces with an immobilized liquid film to trick the bacteria into thinking they had nowhere to attach and grow. First described in the September 22, 2011, issue of the journal Nature, the super-slippery surfaces have been shown to repel both water- and oil-based liquids and even prevent ice or frost from forming. Aizenberg and her collaborators reported that SLIPS reduced by 96% the formation of three of the most notorious, disease-causing biofilms—Pseudomonas aeruginosa, Escherichia coli, and Staphylococcus aureus—over a 7-day period. 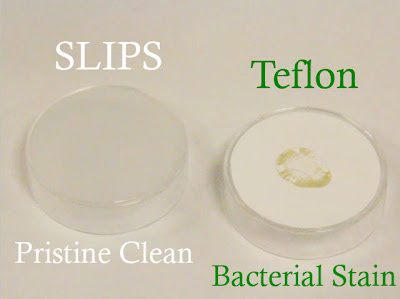 This shows the SLIPS technology for preventing biofilm formation as compared to a Teflon coated surface.